A flavorsome citrus cupcake ready to eat whenever you like and great for baking for satsangs. 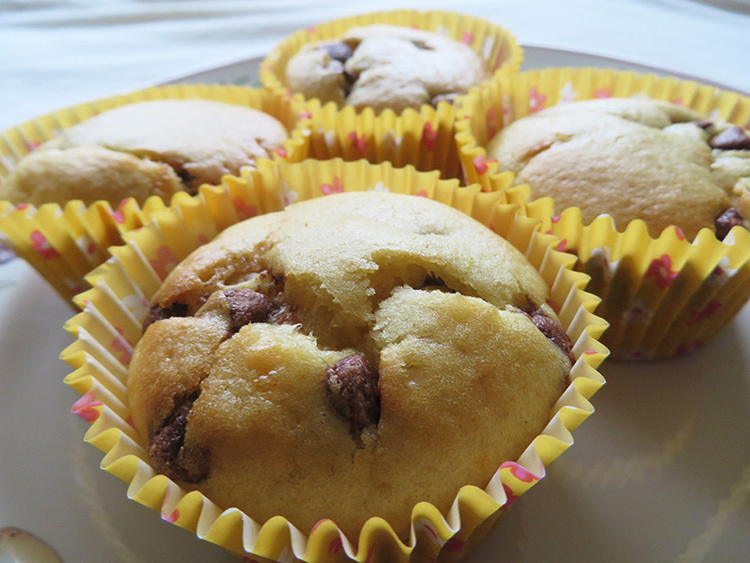 Preheat the oven to 180 °C and line a muffin tray with cupcake cups. Sift the self-rising flour and baking powder into one large mixing bowl. In another small mixing bowl, add sugar, yogurt, vanilla essence and oil, cream together until smooth. Add orange juice and grated rind to the sugar/yogurt/oil mixture and mix well. Add the flour to liquid mixture a little at a time and mix well. Add the chocolate chips and mix once again. Fill up to half of each cupcake cup with the mixture. Place in the preheated oven for 15 minutes. Place a toothpick into the center of a cupcake. They are done if the toothpick comes out clean. Use grated rind of one lemon and 170 ml fresh lemon juice instead of the orange juice. Use grated rind of 2 limes and 170 mL fresh lime juice. To the cake mixture at the end, add 75 g of desiccated coconut instead of chocolate chips.